Savio Skimmer Lids These decorative covers have a stone-like appearance and are extremely lightweight. Blends well with most surroundings. Hide your Savio Compact Skimmerfilter lid with a natural looking faux stone cover. Provides natural camouflage in the shape of a realistic granite outcropping - made with impressions taken from actual stone! Color is chemically bonded to polyurea substrate for superior UV fade resistance. Rough textured surface readily accepts paint. Designed just for the Savio FilterWeir. This accessory consists of two parts. 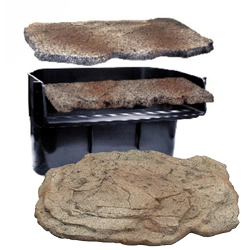 The stone cover provides protection and camouflage for the top of the tank. The stone lip creates a pleasing, natural appearance for your waterfall. The realistic "stone" is crafted from a durable acrylic and fiberglass material that is lightweight and UV fade resistant. Includes 4oz self priming glue for easy installation. Stone lid measures 17.75" x 11.5"
Waterfall stone measures 15.5" x 5.5"
04/11/2019 01:23:06 PM: Looking for a Pond but don't have the space, check out the Patio Pond! 04/04/2019 12:08:45 PM: Knock out pond sludge with our very own specialized sludge remover treatment. Packaged in easy, ready to use water soluble packets that quickly dissolve in the water. Treatment is super easy - simply toss and go. 01/31/2019 11:47:03 AM: Ice Dams- if you choose to run your pump during the winter, and it's powering a waterfall, it's important to monitor for ice dams. These are ice accumulations that can occur at the base of your waterfall during freezing conditions. So, as the pump runs, water has the opportunity to roll over this ice and ultimately out of the pond. Draining your pond. Which, can cause fish loss and ultimately pump failure. 01/22/2019 10:11:02 AM: Filtration is a key element to mostly every clear and healthy pond. When choosing a filter, it's best to decide based on pond size and fish load. Ponds with heavy fish loads will obviously have more debris, so with those ponds you will want to consider oversizing filtration. Remember, you can never have too much. © 1981-2019 Webb's Water Gardens, all rights reserved worldwide.